Page 17 Author's Notes: As began on the previous page, Gavin and Christian's magic mingle as James and Gavin cross, which may have (okay dose have) to do with James magic, now inactive, but still a part of him. Gavin notices the book James is carrying and it pleases him. However, it is while Gavin is paying attention to the book that James turns around and sees Gavin. "Not you. Not now." Gavin seems to have the "not you" kind of thoughts often (anyone know what I'm referring to?). The two, both paralyzed, become locked in a stare that seems to allow an exchange of visions, where we see a young James, Rory as we know her, and a young Gavin. Terrified James tries to get from Gavin what this is, as mentally begs James to not remember what he has seen. 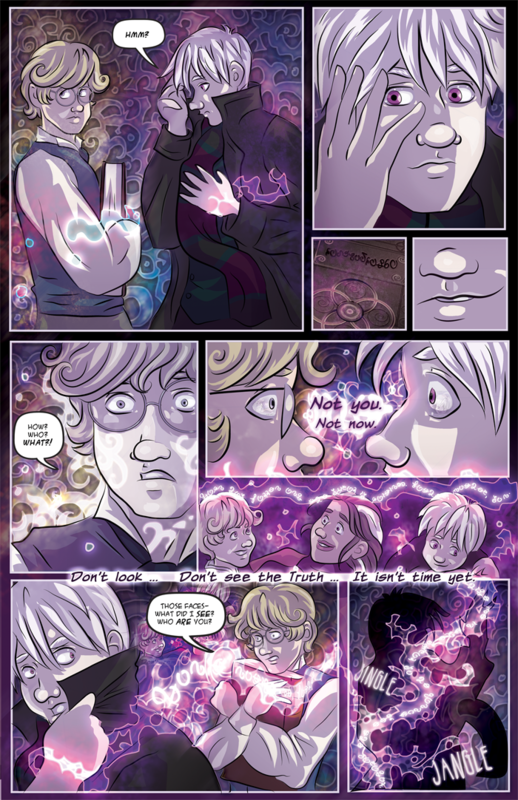 Gavin then casts stronger magic to fade from the view of James, despite whatever magical interference is happening. Also, some of what James sees and Gavin refers to might make more sense if you read "Brothers" (but it doesn't tell you everything). Or you can wait to find out more in the main story arc--the choice is yours.